Following Tony Blair’s recent intervention in the UK election campaign (here), and with UKIP trying its hardest to keep in the headlines, I thought a post on the economic costs and benefits of Britain leaving the EU would be worthwhile. A lot has been written on the subject since PM Cameron pledged to hold a referendum (in his second term, should he get one) back in 2012. Of course, so much of what has been written simply follows the political view/bias of the author(s), such that it is much less about the analysis and much more about the conclusion. That is not surprising given that the topic has become so political (UKIP run on an anti-EU platform, the Conservatives were pressured into offering up the referendum to placate their anti-EU elements, while Labour and the Lib Dems are pro-EU). Meanwhile, opinion polls tend to put the pro-EU camp at a little over 40%, the anti-EU camp around 35%, with the rest undecided. The remainder of this post puts the politics to one side. In addition, I don’t consider any of the social, legal or geopolitical ramifications of the UK leaving the EU (not because they aren’t important – indeed they are likely to be crucial – but because they are pretty much impossible to quantify). Instead I will stick to the economics, which is hard enough to quantify! From my perspective, the cost/benefit analysis has always come down to one big question: what terms could the UK secure on exit? A 2014 paper by the Centre for Economic Performance (CEP), a research group housed within the LSE, “Brexit or Fixit? The Trade and Welfare Effects of Leaving the European Union” looked at the the economic implications of the UK exiting the EU, focusing on the trade implications (costs) and reduced fiscal burden (benefits). They use static global trade model to analyse an optimistic and pessimistic scenario for what sort of negotiated exit the UK might secure. They then try to add in some dynamic effects. The EU accounts for around 50% of UK exports. UK trade with EU countries benefits from membership due to the free movement of goods and services (and arguably labour too). While most focus tends to be paid to the elimination of all tariffs within the EU, just as important are the (ever declining) non-tariff barriers (eg quantitative restrictions, administration, regulation). In the CEP optimistic scenario, they assume that the UK could negotiate to remain in the European Free Trade Association (EFTA), like Switzerland and Norway, and therefore retain the same zero-tariff arrangements. But non-tariff barrier costs would rise (assumed to be equivalent to one quarter of the non-tariff costs faced by US exporters to the EU). The UK would also see reduced benefit from further integration with the EU. 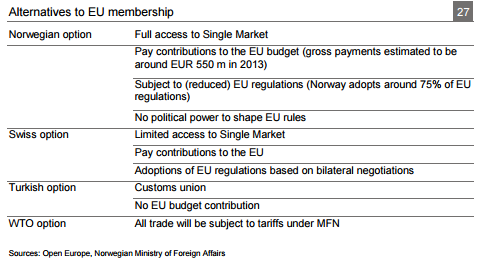 In the pessimistic scenario they assume that the UK cannot secure membership of EFTA, and instead have the highest allowable tariffs under the WTO placed on their goods and services. In addition, the UK would see increased non-tariff barrier costs (assumed to be two-thirds of costs faced by US exporters) and would not benefit from the expected future increased EU trade coming from improved integration. If the UK was to exit the EU (and not remain a member of the EEC), then it would no longer be required to pay contributions to the EU Commission. That would amount to a net windfall of around €9bn per year (the UK does receive some grants from the EU, such as for farming and infrastructure, but is overall a large net contributor). Some (or all) of that windfall could be redirected towards those losing as a result of exit. The CEP paper finds that in the optimistic scenario there would be a one-off loss of a little over 1% of GDP, while in the pessimistic scenario that rises to a little over 3%. Most of the loss can be explained by the cost associated with not benefiting from future fall in non-tariff barriers. The authors cite a variety of studies that show that the dynamic benefits/costs of higher/lower trade can result in multiples of two or three times what the static trade model analysis would suggest. That is because increased trade tends to have a number of other positive spin-offs for the economy – eg increased productivity from more competition, innovation and adoption of technology. If those dynamic factors were as powerful as studies suggest, then the worst-cast scenario may be a loss of nearly 10% of GDP. The authors identify a number of other UK-specific factors that may result in higher costs again. In particular, they suggest that FDI into the UK is likely to suffer due to reduced access to EU markets (while they do not identify it, this is likely to be especially damaging to financial services). What have the CEP missed? While the CEP paper probably represents the best attempt (that I have found anyway) of trying to quantify the trade implications of Brexit, there are a number of potential offsetting factors that the paper does not consider. Eg one argument for leaving the EU is to reduce the regulatory burden on UK firms. The argument being that over-zealous bureaucrats in Brussels have increased the cost of business through regulations such as the Working Time Directive etc. In addition, many argue that a number of the European financial regulations that have been imposed post-crisis are damaging to London as a financial centre (eg short selling ban, bonus cap). While the City overwhelming believe Brexit would be a negative for the financial services industry (a survey by TheCityUK found 81% held this view) it is far from obvious that going it alone would result in the UK having a less tough capital and liquidity regime for UK banks. Instead the cost is likely to come with relocation of business to Frankfurt or Paris (the same survey found 37% considered a partial relocation likely in the event of Brexit). Finally, Switzerland has chosen to adopt many of the EU regulations, despite not being required to under EFTA membership. That is, in part, because they see that the cost of non-tariff barriers would be considerable if they did not adopt the EU directives, making membership of EFTA of much less worthwhile. But as they are not part of the EU, they do not get any say in the formulation of these regulations/directives. Would the UK be prepared to accept no role in policy formulation in order to keep down non-tariff barriers? The economic cost/benefit analysis (at least when restricted to trade and fiscal implications) seems to be fairly clear. Brexit would be costly for the UK. However, there are other factors that are much harder to quantify that may act to offset some of those costs, or may even increase them. And that says nothing of the geopolitical implications of the UK sitting outside the EU. Sadly, if the referendum does come to pass, I doubt much of any of the above will feature in the campaigning. Those wanting Brexit will simply appeal to nationalistic arguments, and those wanting to stay in the EU (even if reformed in some way) will struggle to get any traction on the economics. Assuming that euro area countries will (slowly) move towards further integration, there are big questions for the “outs”. The UK has chosen to stay out of the Banking Union, and while it is subject to EU Commission fiscal compact rules, will not be a contributor to any future European financial backstop. If a closer fiscal union does come to pass, and who knows, in my lifetime maybe even a political union, then clearly the UK’s relationship with the EU will have to continue to evolve. But it doesn’t seem to me like exiting in the next few years is likely to be the best course of action.